Ever since the holidays, due to many unforeseen circumstances, my schedule has been thrown for a loop and it’s been spiraling downward ever since. There’s no worse feeling for a Family Manager than to know you are teetering on the cusp of disorganization in many areas of your life, and even though you try to grab the reigns, they keep slipping through the fingers. With much work on my part to pull things together and the crazy pace of basketball ending, we are finally, FINALLY, getting back to normal. I truly think it started when I began detoxing. It was that act of discipline that helped me jump start things. Since then, I’ve started losing the weight I’ve gained (and have kept it off), been working out again with Jillian (she’s brutal, but you all are helping hold me accountable on facebook) and I have started de-cluttering this ole house of mine. When disorganization hits, it affects so much more than just the home, it culminates in many areas of my personal and spiritual life, but taking the schedule back and re-prioritizing has been amazing. For a while, I didn’t know which way was north and when that happens, meal time is the first to go. You’d think with my deep desire to wow my family with amazing 10 minute dinners, this should never be an issue, but when the fridge isn’t stocked with the necessary ingredients, even if a meal takes 10 minutes of prep time, it still doesn’t become a reality. These four meals are ones that are my typical “Go to” meals in a pinch. Typically, I keep all the ingredients stocked and on hand for these four meals and they are so yummy. My Citrus Herb Chicken can be whipped up even for company and with only a few ingredients necessary, it’s on my meal plan a lot. You don’t even have to precook your noodles for this one. 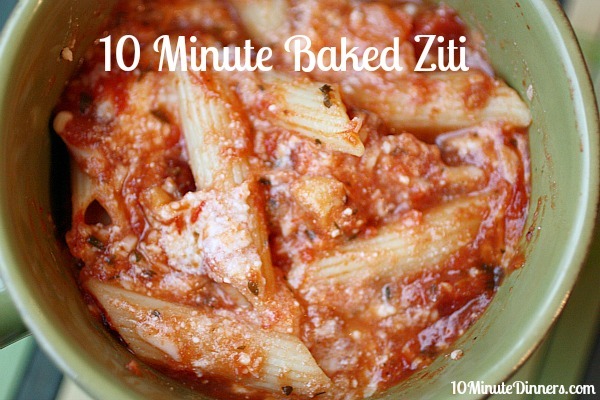 We are pasta lovers, blond Italians my hubby always says and this one my kids would eat every day. Typically, I always have some Crock Pot Taco Meat already cooked up and ready to go in the freezer. Last month, it was all used up, so I need to prioritize this again because it comes in handy for so many meals. There’s no excuse for me not to have it ready. I’ve served this Easy Taco Ring and Turkey, Ham and Cheese Ring for showers, parties, and even fancy occasions, but it’s always requested by my kids. Yes, it’s that yummy, and I am a hero in my own kitchen for barely any work. Sometimes I just need a fresh perspective on my meal plan and I’m ramping up my 10 Minute Dinners site again, so it’s fun to be productive with my own family, while I share my recipes with you. It’s a win-win. Some additional recipes I shared recently on the site: Homemade Shrimp Fettuccine Alfredo, Crock pot Meatball Sub Sandwiches and top those meals off with an easy, yet elegant Chocolate Souffle. 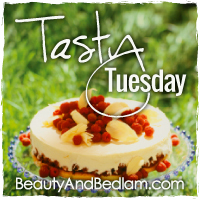 So what are you sharing for Tasty Tuesday? I love seeing what you’re all cooking up in the kitchen. Remember to link up your recipe, please link back directly to my site in your post and then share the love with a comment. This is where we are right now. No sports, but drama, dance, scouts and several out of town trips each month has me in survival mode. My mantra, “Keep my family fed, keep them clothes, and keep the house clean enough to not be condemned.” Looking forward to May 1st. Yum!!! I am pinning your recipes because I need quick, tasty meals, our family is always busy busy busy and I need to feed them right! Thanks for sharing! Congrats on grabbing onto those reigns tight! I am taking advantage of this time between basketball and softball season to reorganize as well!!! Stock that freezer with my taco meat and my sauteed chicken. A family can live on those two things 😉 Keep up the good work!!! That taco ring looks fantastic. I bet my kids would eat it. Thanks for the idea!